Sixth Domain - Creating positive and collaborative learning experiences for everybody in schools, everywhere. for everybody in schools, everywhere. Web-based apps for student tracking, teacher collaboration, information sharing and decision-making. Reward System is a fully integrated configurable online school reward system and behaviour tracking tool. Motivating for pupils and engaging for teachers and parents. Requiring no training to use, staff can input, track and monitor good and bad behaviour throughout a school. 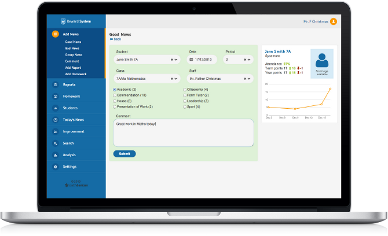 Senior leaders and managers can analyse and evaluate trends and follow up incidents with minimal admin. Parents can view their son or daughter's reports and can be updated termly, weekly or even daily, automatically with an overview of all incidents, good and bad. Credited by Ofsted as being a very effective tool for managing pastoral issues, Reward System is rapidly growing as a necessary tool for all schools. Positivity works, it means when you have to be negative; people listen. You need boundaries, you need structure, and you need consistency. That's what our apps deliver. Our software helps you to communicate, with teachers, with parents and with pupils. It builds collaboration, cooperation and trust. You shouldn't need training in using our products. They're intuitive so we don't have to sell you training. Data doesn't need to be difficult. It can be logged, analysed and presented in a way that can be understood and used effectively, by everyone. We build our products to look and feel good to use, with input from the people that use them. That means you use them more, and they have more effect. No hard sell, no setup fee, just a plain English agreement. "enables pastoral leaders to monitor very effectively students' successes and areas for development"
"extremely well received by both staff and parents... used extensively by staff on a daily basis"
"incidents of racism and bullying have been more rigorously reported and have seriously reduced"